You're a writer! You've worked hard on your manuscript, and it has been through professional content and copy editing. Now it needs a final read through to make sure it is free from typos, misused and missing words, and formatting issues such as misplaced punctuation. Let me help polish your manuscript before you self-publish or submit to a publisher for consideration. Have you entered a writing contest or sent proposals to agents or acquisition editors, only to have your manuscript rejected? Worse yet, you received vague or no feedback on what was wrong with your submission. I would love to read the beginning of your manuscript or short story (first chapter/up to 3,000 words) and give you the necessary feedback to take your work to the next level. I’ll offer suggestions on how to make your story pop, corrections on point of view (POV), how to hook and keep your reader, mark grammatical errors, and polish your manuscript so it shines. In addition to having a polished contest entry or first chapter for an agent pitch or proposal, by applying my suggestions to the rest of your manuscript, you’ll save money if you decide to hire an editor later for your entire project. *The industry standard for a page is 250 words. Divide your word count by 250 to get total manuscript pages. Having trouble with the dreaded synopsis that’s a required part of any book proposal? I recently saw a meme of “A League of Their Own” where Tom Hanks is screaming at one of the lady baseball players: “There’s no crying in writing, except when writing the synopsis.” I think we all can relate to that! Like most writers, I struggled with writing a synopsis until I had several under my belt. Once I quit dreading them, I found having a synopsis is good first step toward writing my manuscript. Let me help make your synopsis better so an acquisition editor wants to read your whole manuscript! In addition to proofreading, I will also check for major plot points, character development, and story flow (up to two pages single-spaced synopsis). Does your blog post need a fresh set of eyes to catch those pesky typos? Or maybe you’d like your post to have an intro that pops or an ending that leaves the reader thinking. I’ll be glad to read and offer suggestions, as well as mark typos and poor sentence structure. Please put the word "Editing" in the subject line. ​Payments are accepted through Paypal. ​Laura Hodges Poole is a Christian writer with four books and dozens of articles, devotions, and short stories to her credit. She has contributed to anthologies and ghostwritten two nonfiction books. Her articles have appeared in publications such as Reach Out Columbia, P31 Woman, WOW-Writing on The Word, Christian Devotions, Evangel, Christian Home and School, Our Town, and Independent Mail. Her upcoming Christian romance novel, Return to Walhalla, will be released in March 2018. Laura is the 2016 ACWC Badge of Honor winner, a 2014 ACFW Genesis semi-finalist, and a 2012 RWA Emily finalist. Her credits include being a writing conference contest judge in 2017. 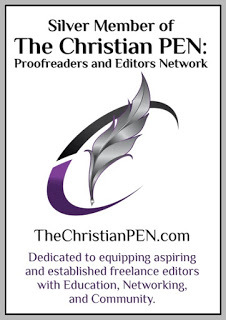 As an editor and member of The Christian PEN, she enjoys mentoring and helping other writers polish their work. Her passion is encouraging others through her blog, A Word of Encouragement. When she’s not writing, you might find her hiking, playing the piano, or being crafty. A mother of two, Laura lives in South Carolina with her husband and son.